I'm so jazzed we're hosting Nathan Bransford this week! Mr. Bransford—who is a children's author, former literary agent, and blogging legend—gave this blog its start when he offered me a guest spot on his blog in 2010. I wrote a piece on why you should keep writing, no matter what, called You May Be a Bestseller on Trafalmadore. In spite of endless rejections, I was able to follow my own advice, partly because of the growing readership of this blog, due in part to that guest post. A year and a half later, I got three publication offers in the space of a week. I chose to go with two small presses, and within a few months, I had seven books in print. Two of them have become bestsellers. As much as it may disappoint us, entire plots do not spring forth fully formed from our brains for us to breezily channel into words. You will not have a Eureka moment where you suddenly have an entire idea for a novel, from start to finish, that you can transcribe in mere days, and even if this should miraculously happen to you once, you should not tell another writer because they will hate you forever. More likely, you’ll have a vague idea that might be the merest embryo of a novel. A tiny shard. A little novel sapling that needs to be lovingly coaxed not just into a tree but into an entire forest. The entire Jacob Wonderbar series emanated from a single idea I once had when I was feeling very relaxed. Here is the idea: a kid gets stuck on a planet full of substitute teachers. That’s it. That’s all I had. When I thought about that kid running away from the substitutes on a strange world, I knew I was going to write the novel. It was that unshakeable needle sticking in my brain. I just had to figure out what in the world was going to happen to fill out the rest of the story—which ended up being three novels. I had to flesh out the idea. And yes, all you improvisers out there, this chapter is starting to sound like planning in advance, and you have likely already broken out in hives. But bear with me. Even if you’re an improviser, following these few steps will go a long way toward helping you flesh out an initial idea, and this process will give you some surer footing before you start. How did he get into space to begin with? (Answer: he traded a corndog for a spaceship). Why is he stuck in space? (Answer: when he blasted off into space, he accidentally broke the universe, and now he can’t get home). Why are substitute teachers in space? (Answer: there’s an entire galaxy full of wacky space humans). The more questions I answered while brainstorm- ing, the more I began to flesh out and add flavor to the world of the novel. These questions aren’t just about deciding what actually happens in the plot (much of that can and will change later, anyway). Instead, you’ll begin to get a sense of what type of novel you’re going to write. Is it a funny novel? A sad one? Is it dark? Is it for kids? Adults? You’re learning about the setting of the novel, the style of the writing, and where the story is eventually going to go. Instead of setting out ahead of time to write a particular type of novel, I let the idea guide me. When I had that first glimmer of an idea for Jacob Wonderbar, I had no prior notion that I wanted to write a wacky middle grade novel. I just went with the idea. When I started fleshing it out, it sounded like it was for 8- to 12-year-olds, so okay. I had the beginning of a middle grade novel. Ask questions until your idea starts to make sense and you know what you have. The more you know about your world, the more you can build around your central idea and let it guide you. Don’t stop with questions. Think about what matters in your novel. A secondary idea I had while brainstorming for Jacob Wonderbar was that his dad could perhaps be lost in space. It would be too easy if Jacob knew for certain that his dad was out in space, so I created a mystery around it: Is his dad wandering around somewhere in outer space, or did he really just move to Milwaukee when Jacob’s parents got divorced? With every character I introduced, I tried to figure out at least two things they wanted, preferably the type of things where I could put a “but” in the middle when I described them because they don’t easily go together. The space pirate loves pulling off wild stunts, but he also wants to be president of the universe. Sarah, the sassy tomboy, cares about her friends, but she also wants to be tough. Dexter, the timid sidekick, wants to stay out of trouble, but he’s also loyal to Jacob. For the novel as a whole, I raised the stakes for everyone: space humans might just want to destroy Earth. Again, not all of this has to be figured out before you start. It’s okay to go in with unanswered questions, but starting to think through the motivations of the characters will help you to guide the story. Once I knew that Jacob wanted to find out what happened to his dad, I created one huge obstacle and one huge thing he cared about: he didn’t know where his dad was (obstacle), but he really wanted to find him (the thing he cares about). And oh yes, there is that pesky obstacle of having broken the universe, so it’s not easy to get home. Don’t just think about how to get your characters from Point A to Point B as you flesh out your idea, but think about how to make this journey as difficult for them as possible. With just these initial questions, a few big obstacles, and the underlying motivations of the main characters, I had the basic arc of the entire first novel, and the groundwork for the series, before I started writing. Jacob trades a corndog for a spaceship and blasts off into space with his best friends. They break the universe (obstacle), they get separated by a rogue space pirate (obstacle), and Jacob eventually begins to suspect his dad is in outer space (obstacle + what he cares about), but he also wants to get back home (another thing he cares about, which competes with his desire to find his dad). This still wasn’t enough material for an entire novel, and there was a ton I didn’t know about the story and the characters before I started. However, I had a rough idea of where things were going to go, and I was well on my way. If you ask yourself these questions and begin to figure out what your characters want, why it all matters, and why their task is difficult, you will be on your way, too. How about you, Scriveners? Are you a pantser or an outliner? If you're a pantser, do these tips help to flesh out that vague idea in your mind? Do you have any other tips for getting that idea growing without hemming yourself in with a rigid outline? Do you have any questions for Nathan? Nathan Bransford is the author of How to Write a Novel (October 2013), Jacob Wonderbar and the Cosmic Space Kapow (Dial, May 2011), Jacob Wonderbar for President of the Universe (Dial, April 2012) and Jacob Wonderbar and the Interstellar Time Warp (Dial, February 2013). He was formerly a literary agent with Curtis Brown Ltd. and is now the Director of Community and Social Media at Freelancers Union. He lives in Brooklyn. 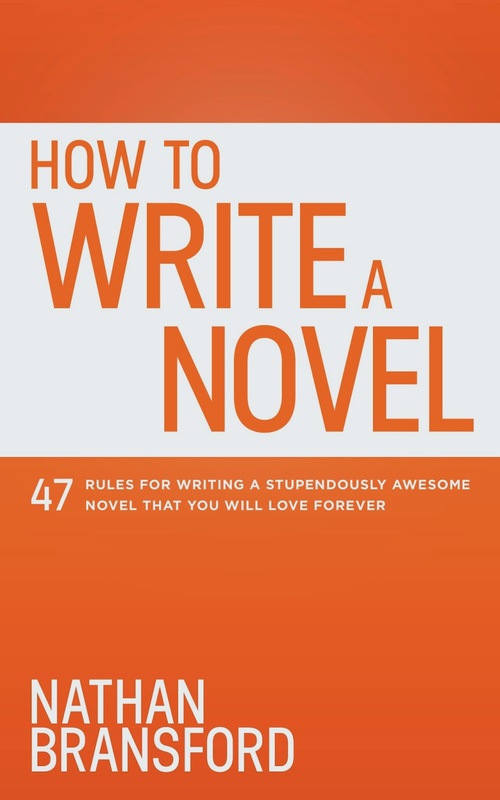 Read the guide that New York Times bestselling author Ransom Riggs called “The best how-to-write-a-novel book I've read”! "Nathan Bransford's book on how to write a novel is smart, generous and funny as hell. Read it. No matter where you are in your writing life, whether you're on your first book or are a grizzled, multi published veteran, you'll find practical advice to help you through the process -- and plenty of wisdom to inspire you along the journey." "In his 47 brilliant rules, Nathan Bransford has nailed everything I've always wanted to tell people about writing a book but never knew how. Wonderfully thought out with lots of practical examples, this is a must-read for anyone brave enough to try their hand at a novel. It's also a great review for experienced writers. Highly recommended." BLUE EARTH REVIEW FLASH FICTION CONTEST $2 ENTRY FEE. 750 words or less. Limit two stories per entry. First place $500. Second place $250. Third place $100. Winners will be published in the Blue Earth Review, the literary magazine of Minnesota State University. Deadline August 1. A ROOM OF HER OWN FOUNDATION ORLANDO PRIZES $15 ENTRY FEE. Four Orlando prizes of $1,000 each and publication in The Los Angeles Review are awarded twice yearly for a poem, a short story, a short short story, and an essay by women writers. Deadline July 31, 2014. Mash Stories: No entry fee. $100 prize. Quarterly short story competition aimed at promoting new talent. Flash fiction up to 500 words. Must incorporate the words: monkey, cathedral, relativity. Stories are voted on continuously throughout the submission period. Shortlisted stories are featured on the Mash website, professionally narrated on Mash podcast, and included in their magazine Deadline July 15. The Saturday Evening Post "Celebrate America" Short fiction contest. $10 ENTRY FEE. The winning story will be published in the Jan/Feb 2015 edition of The Saturday Evening Post, and the author will receive a $500 payment. Five runners-up will each receive a $100 cash payment and will also have their stories published online. Stories must be between 1,500 and 5,000 words in. All stories must be previously unpublished (excluding personal websites and blogs). Deadline July 1. MARK TWAIN HOUSE HUMOR WRITING CONTEST ENTRY FEE $12 or $22. First prize $1000. Other cash prizes. Celebrity judges. Two age categories: Adult (18 and over) and Young Author (17 and under). Submit 10,000 words (or fewer) of any original work of humor writing. Submissions are not required to be in the style of Mark Twain or about Mark Twain. They want you to make them laugh! Deadline June 30, 2014.